Marriott International is working to curate more personalised experiences and activities for customers while traveling with a new acquisition. The hotel chain has invested in online metasearch platform for tours and activities PlacePass to provide its members more authentic travel experiences. It will also pull from the considerable amount of information Marriott has about its guests, especially the loyalty program members, to make recommendations. Travelers will soon be able to choose from an additional 100,000 local experiences in 800 destinations worldwide when they book directly on Marriott.com or SPG.com or via their respective apps. 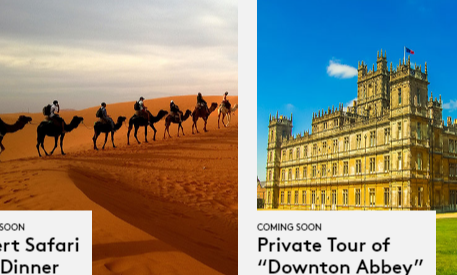 Activities listed by PlacePass are a picnic in the Grand Canyon, a tour of UK filming sites of the TV series Downton Abbey, and the chance to cook pasta with an Italian chef in Italy’s Tuscany region. The news comes as Marriott announced membership in its loyalty programs – Marriott Rewards, which includes The Ritz-Carlton Rewards, and Starwood Preferred Guest (SPG) – has surpassed 100 million members. The hotel chain appears to be taking a cue from companies such as TripAdvisor and Airbnb, both of which have branched outside of their core businesses to invest in destination listings services. Last November, Airbnb debuted new product “Trips” by adding listings of local tours and experiences in 12 cities. “We want our guests to count on Marriott to give them access to more of the destinations and things they love to do when they travel,” said Stephanie Linnartz, global chief commercial officer of Marriott. “Together with Marriott, we will connect guests to great experiences so they make the most of their travels, connect with locals, and discover the world in new ways,” said Emily Bernard, chief brand officer and co-founder of PlacePass. Pizza Hut Malaysia has launched its new ‘Super Pan Pizza’ offering backed with a RM1.5 million advertising and promotions budget. ..